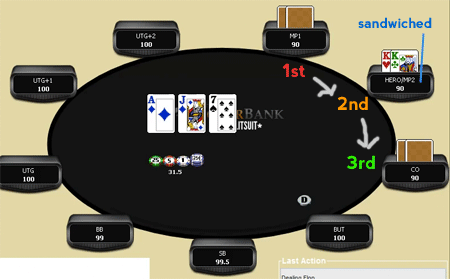 Should you multi-way cbet with overcards when you have position? Would you lose value by checking behind? Playing in position with 2 overcards. TPGK on the flop and sandwiched between two players. How do you play after a failed resteal (3bet) when between 2 players with a hand like K9? Worse still, you've hit bottom pair. 3bet with KK and get 2 callers. Perfect. Ace on the flop. Standard. To make it even more fun, you're sandwiched between two players, again. Where do you go from here? Pocket aces, 3bet and get called by two players. Flop has a flush and straight draw, but the pot is big compared to the stack sizes (2.9 SPR). How do you get the most money from the hand? Also, flush and potential straight) draw completes on the turn. Do you bet or check/call? Raise with JTs preflop and hit inside straight and backdraw flush draw, but 2 big overcards. Not a great hand, but there's some opportunity. Can you semi-bluff a hand like this effectively? Includes a highly interesting analysis on opponents' hand strengths on the flop. Multiway Cbetting – Veer away from bluffing and make the most of value bets. When and how to continuation bet when up against 2 or more players on the flop. Cbetting has a different dynamic when more than one opponent is involved, so you need to know how to deal with it. SplitSuit covers 11 hand histories where this happens and have we have to deal with these "multi-way cbetting" situations. SplitSuit starts with some common multi-way cbetting spots, and moves on to some trickier ones later on in the video. All of the analysis extends across the turn and the river – it does not end with the flop cbet strategy. The majority of the hand examples involve cbetting against 2 opponents. Furthermore, in these examples we are usually sandwiched between these two players. By "sandwiched" I mean we are the 2nd player to act (so not first or last to act). In addition to the standard preflop situations, Hand 7 (18:21) and Hand 8 (21:39) include 3betting action before the flop. Sandwiched = being the "middle" player to act after the flop when up against 2 other players. We usually have the initiative in these examples, making our position overall a little better.